Two-Line Analog Master Base and DECT Cordless Extension Our AGR series of DECT cordless phones sets the standard for style and function. With the most compact footprint available in a hotel cordless phone, you'll love how the AGR cordless fits in just about anywhere. Our unique design features programmable guest service keys on both the handset and base, so its easier for guests to reach the services they need. When it's easier for guests to order services, you'll earn more revenue! Full duplex speakerphones on both the handset and base provide even greater guest convenience. Now, no matter where guests are in the room or suite, they can enjoy a quality speakerphone call! One-Line Analog Base and DECT Cordless Extension Our AGR series of DECT cordless phones sets the standard for style and function. With the most compact footprint available in a hotel cordless phone, you'll love how the AGR cordless fits in just about anywhere. Our unique design features programmable guest service keys on both the handset and base, so its easier for guests to reach the services they need. When it's easier for guests to order services, you'll earn more revenue! Full duplex speakerphones on both the handset and base provide even greater guest convenience. Now, no matter where guests are in the room or suite, they can enjoy a quality speakerphone call! Two line DECT Cordless Extension and Stand-Up Charger Our AGR series of DECT cordless phones sets the standard for style and function. With the most compact footprint available in a hotel cordless phone, you'll love how the AGR cordless fits in just about anywhere. Our unique design features programmable guest service keys on both the handset and base, so its easier for guests to reach the services they need. When it's easier for guests to order services, you'll earn more revenue! Full duplex speakerphone on Handset provides greater guest convenience. Now, no matter where guests are in the room or suite, they can enjoy a quality speakerphone call! Two line DECT Cordless Extension and Charger Base Our AGR series of DECT cordless phones sets the standard for style and function. With the most compact footprint available in a hotel cordless phone, you'll love how the AGR cordless fits in just about anywhere. Our unique design features programmable guest service keys on both the handset and base, so its easier for guests to reach the services they need. When it's easier for guests to order services, you'll earn more revenue! 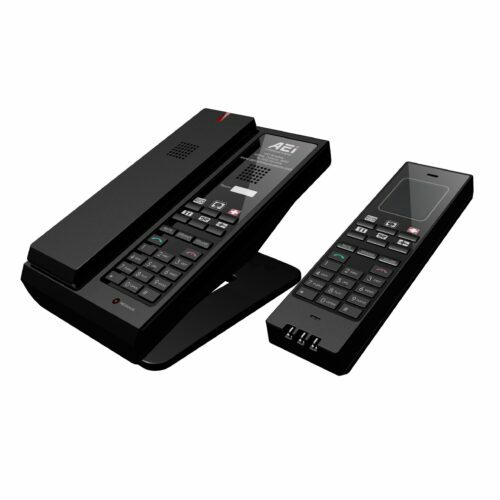 Full duplex speakerphone on Handset provides greater guest convenience. Now, no matter where guests are in the room or suite, they can enjoy a quality speakerphone call! One-Line DECT Cordless Extension and Stand Up Charger Our AGR series of DECT cordless phones sets the standard for style and function. With the most compact footprint available in a hotel cordless phone, you'll love how the AGR cordless fits in just about anywhere. Our unique design features programmable guest service keys on both the handset and base, so its easier for guests to reach the services they need. When it's easier for guests to order services, you'll earn more revenue! 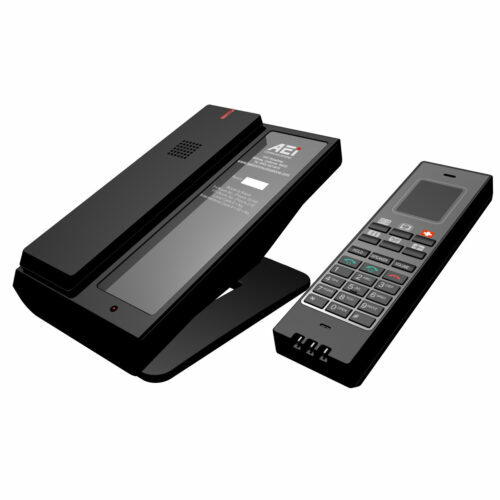 Full duplex speakerphone on handset provides greater guest convenience. Now, no matter where guests are in the room or suite, they can enjoy a quality speakerphone call! One-Line DECT Cordless Extension and Charger Base Our AGR series of DECT cordless phones sets the standard for style and function. With the most compact footprint available in a hotel cordless phone, you'll love how the AGR cordless fits in just about anywhere. Our unique design features programmable guest service keys on both the handset and base, so its easier for guests to reach the services they need. When it's easier for guests to order services, you'll earn more revenue! 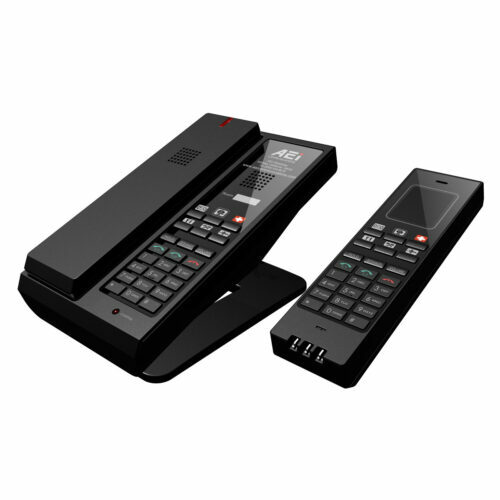 Full duplex speakerphone on handset provides greater guest convenience. Now, no matter where guests are in the room or suite, they can enjoy a quality speakerphone call! Two-Line Analog Master Base and DECT Cordless Extension Our AGR series of DECT cordless phones sets the standard for style and function. With the most compact footprint available in a hotel cordless phone, you’ll love how the AGR cordless fits in just about anywhere. Our unique design features programmable guest service keys on handset, so its easier for guests to reach the services they need. When it’s easier for guests to order services, you’ll earn more revenue! Full duplex speakerphones on handset provide even greater guest convenience. Now, no matter where guests are in the room or suite, they can enjoy a quality speakerphone call! One-Line Analog Base and DECT Cordless Extension Our AGR series of DECT cordless phones sets the standard for style and function. With the most compact footprint available in a hotel cordless phone, you’ll love how the AGR cordless fits in just about anywhere. Our unique design features programmable guest service keys on handset, so its easier for guests to reach the services they need. When it’s easier for guests to order services, you’ll earn more revenue! Full duplex speakerphones on handset provide even greater guest convenience. Now, no matter where guests are in the room or suite, they can enjoy a quality speakerphone call! 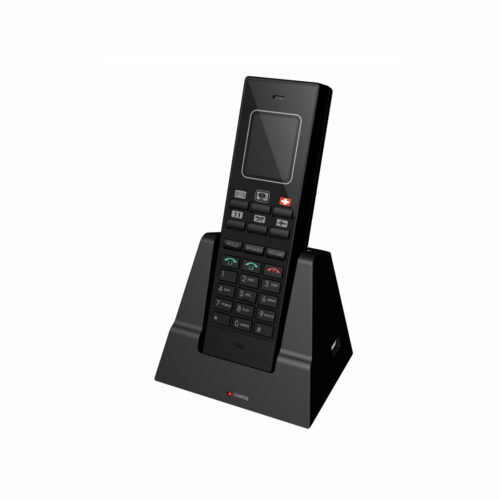 One - Two Line Analog DECT Cordless Telephone Our VM series (A) of DECT cordless Mid-Size Telephones, sets the standard for style and function. With the most compact footprint available in a hotel cordless phone, you'll love how the VM cordless fits in just about anywhere. Full duplex speakerphones on base provide even greater guest convenience. Now, no matter where guests are in the room or suite, they can enjoy a quality speakerphone call!